The aim of the Solo Now! 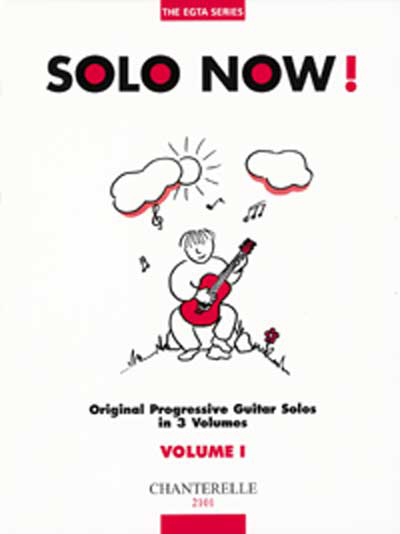 books is to provide the elementary guitarist with a progressive and stimulating collection of pieces that specifically focus on right hand technique. This first volume minimizes the demands made on the left hand so that the student can concentrate on the the formation of a stable, yet relaxed right hand technique. WRIGHT Richard: Toy Soldiers, Banjo Joe, Daydream, Scene from Childhood, The Waiting Game, Chimes, F is for Fun. COTTAM David: In the Rainforest, Chatterbox, A Thumb on the Nose. BOWERS Timothy: Petite Chanson, Ballad. LINDSEY-CLARK Vincent: Ice Forming, Ice Melting, By the Fireside, Summer Clouds. BATCHELAR Peter: Stone Circle, GOSS Stephen: Three Ghosts, A Sad Waltz, At the Fair. IVANOVIC Vojislav: Dance of the Bells, Evening Tune. WATERS Steve: A Musing, DOWNS Colin: Ceilidh, L.A.